Lourdes rosary beads and catholic rosaries, with some containing Lourdes water drawn from the miraculous spring at the grotto. 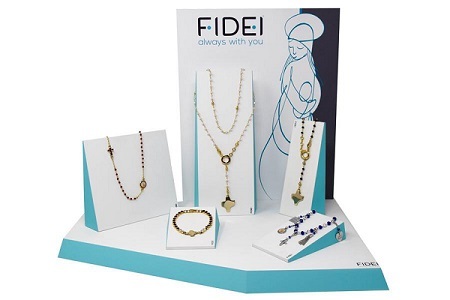 All our rosary beads depict the scene of the Lourdes apparitions, dedicating them to Our Lady of Lourdes and Saint Bernadette. 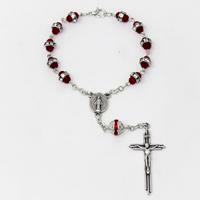 Providing Catholic Products Worldwide, at Discount Prices. The apparitions at Lourdes began with a prayer, and they continued with a prayer. During the first apparition, Bernadette took out her rosary and tried to make the sign of the cross, but was unable to, her hands trembled. The lady who Bernadette was seeing made the sign of the cross, the second time Bernadette manage to repeat the same actions, of the lady who was dressed in white. Bernadette recited the rosary and then the lady disappeared. These were the words of Bernadette "The Lady held her rosary and made the sign of the Cross as if starting to pray. My hand trembled. Once again I attempted the sign of the Cross and managed. Kneeling, I recited the Rosary". There are 20 mysteries in the Rosary, 5 Joyful Mysteries, 5 Luminous Mysteries, 5 Sorrowful Mysteries and 5 Glorious Mysteries. 6) For each of the 5 decades, announce the Mystery, followed by the 'Our Father'. 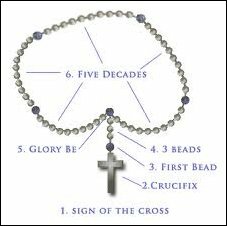 Say 10 'Hail Mary's' while touching each of the 10 beads within the decade a. Next say a 'Glory Be'. After each decade pray "O my Jesus, forgive us our sins, save us from the fires of hell. Lead all souls to Heaven, especially those who have most need of your mercy". O God, whose only-begotten Son, by his life, death, and resurrection, has purchased for us the rewards of eternal life. Grant, we beseech thee, that while meditating on these mysteries of the most holy Rosary, of the Blessed Virgin Mary, we may imitate what they contain and obtain what they promise, through the same Christ our Lord. Amen. I believe in God, the Father Almighty, creator of Heaven and Earth and in Jesus Christ, His only Son, Our Lord, who was conceived of the Holy Spirit. Born of the Virgin Mary, suffered under Pontius Pilate, was crucified, died and was buried. On the third day, he rose again, he ascended into Heaven & is seated at the right hand of God, the Father Almighty. He will come again to judge the living and the dead.I believe in the Holy Spirit, the Holy Catholic Church, the Communion of Saints, the forgiveness of sins, the resurrection of the body and life everlasting. Our Father, who art in Heaven, hallowed by Thy name. Thy kingdom come, Thy will be done, on earth as it is in Heaven. Give us this day our daily bread and forgive us our trespasses, as we forgive those who trespass against us. And lead us not into temptation, but deliver us from evil. Glory be to the Father, and to the Son and to the Holy Spirit. As it was in the beginning is now, and ever shall be, world without end. Hail, Holy Queen, Mother of mercy! Hail, our life, our sweetness and our hope! To Thee do we cry, poor banished children of Eve. To Thee do we send up our sighs, mourning and weeping in this valley of tears. Turn then, most gracious advocate thine eyes of mercy towards us and after this, our exile, show unto us the blessed fruit of Thy womb, Jesus.